The Great Lafayette & Beauty, the dog Houdini gave him. 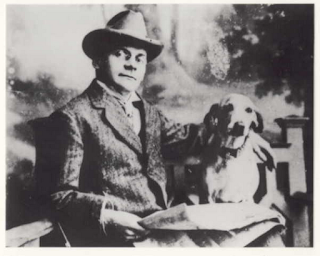 I have written several times about how Houdini gave The Great Lafayette the gift of a dog while the two both were appearing in Nashville. Lafayette named the dog, Beauty, and it would become his traveling companion and best friend for the rest of their lives. In 1899, Houdini and Lafayette were both in Nashville and appearing at the old Grand Theater (Grand Opera House). On November 6th, went down to the Nashville Police Department, unannounced. As the story goes, Houdini came into the station house, along with some reporters and made the claim they could lock him up in their cuffs and he could get out. The police in the station just laughed at him. Eventually, they brought out three pairs of cuffs, one of which hadn't been opened in 10 years because no one had a key. Houdini took key-less cuff and stepped out of the room for a moment. When he returned, the cuff was open, to the amazement of the chief of police! The officers locked Houdini in all three pair of cuffs and then, the newspaper article says, "he stepped behind an improvised curtain and began his escape." Houdini was free in 2 minutes and came walking back into the room two minutes later holding the three cuffs which had now been interlocked together. Apparently, according to a March 12, 1924 article in The Tennessean Newspaper, Houdini, recalling the event from years previous, says that the detective who handcuffed him, later gave him a dog. And that Nashville dog, was then given to Lafayette and became the most treasured gift that he would ever receive. Lafayette, later had a fake pedigree made for the dog. On the front door of his home in London Lafayette hung a plaque that read 'The more I see of man, the more I love my dog'. Beauty had her own room and bathroom in the house. She ate five course meals. And an image of Beauty appeared on Lafayette's checks. She also was a member of the cast of his show. To advertise his appearance, a group called 'The Battle of the Colors' would perform an aerial battle over the business district of Nashville. The troupe consisted of four planes taking off from Blackwood Field and being flown by pilots from the National Guard. They would first distribute fliers from the planes and then meet for the mock battle. Part of the fun was shooting red and green sky rockets at each other! I wonder what the FAA would say about that today, lol. 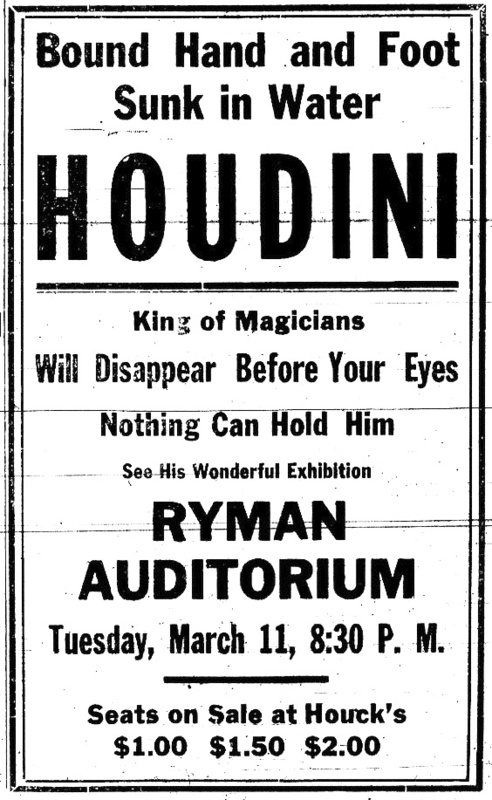 In addition to the airplane battle, articles appeared almost daily in The Tennessean Newspaper proclaiming Houdini's upcoming appearance and how he would be exposing fake mediums. 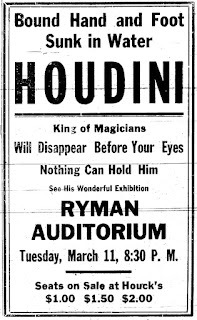 On the evening of March 11th, Houdini began with his lecture of Spiritualism, complete with his slide show. He presented a number of spirit like effects, like how fake mediums made messages appear on spirit slates, and how they could speak through spirit trumpets without being seen. Later he explained how these various effects were done. Houdini even covered one local ghost sighting from the Nashville area, called The Bell Witch of Robertson County. The Bell Witch was so popular that it's said, even President Andrew Jackson apparently had an encounter while encamped with his troops on the Bell Farm. He completed his performance that night with his signature Milk Can Escape. However, it had been advertised that he would present the Water Torture Cell. I'm guessing the stage floor of the Ryman couldn't withstand the 100 gallons of water needed for the USD, so the opted for the Milk Can escape, which still was an under water escape. The Tennessean which covered the event, stated the audience that night was fair. I take this mean this was either not a full house, or the response to the performance was less than expected. The article does mention that the auditorium was freezing inside, so perhaps knowledge of this kept potential ticket buyers away. Or perhaps it was a situation where people were expecting a night of magic, and instead they got a lecture with a few tricks included. This issue had come up before with Houdini's Spirit Exposure Lecture. But I think it's more likely that it was not a sell out crowd. One side note, every ticket holder to the show was given a 25 cent coupon that could be applied to a ticket for that evening's American Legion's Ball, being held at the Hermitage Hotel following Houdini's performance. Great stuff Dean! Interesting that the Milk Can was still in rotation as a back up to the USD. Thanks Leo. I was surprised too at first, but logistically, I don't think the Water Torture Cell was practically for every stage. Would you like to see a C1911 Broadside of "The Great Lafayette " ?